In the Kullu valley in the Western Himalayas, Nicholas and his family found their home. India would provide the backdrop to the last period of the artist's life. 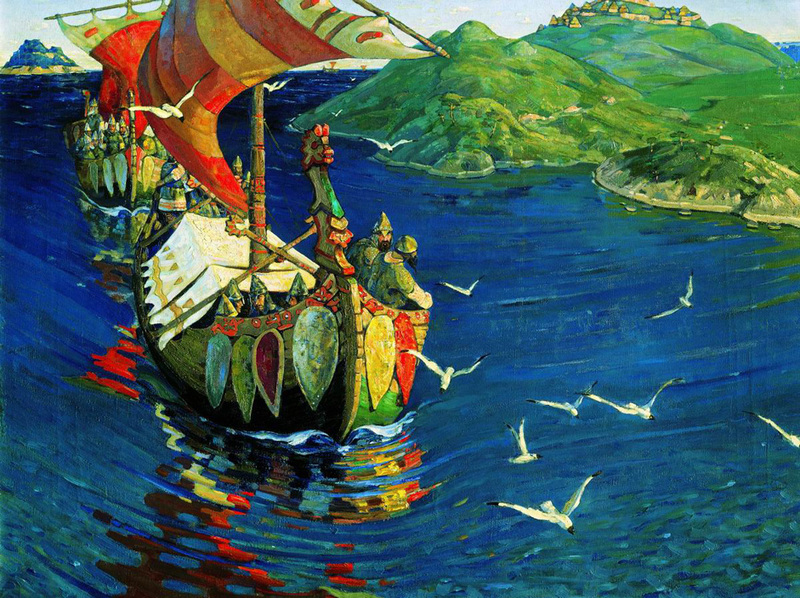 Visitors from over the sea, 1901 // Roerich. The name is inscribed in the annals of world and Russian culture. Nicholas, Helena, and their sons, Yuri and Svetoslav. The extraordinary harmony of this family, representing the essence of spiritual and creative Unity, in which each was uniquely gifted, inspires only admiration. 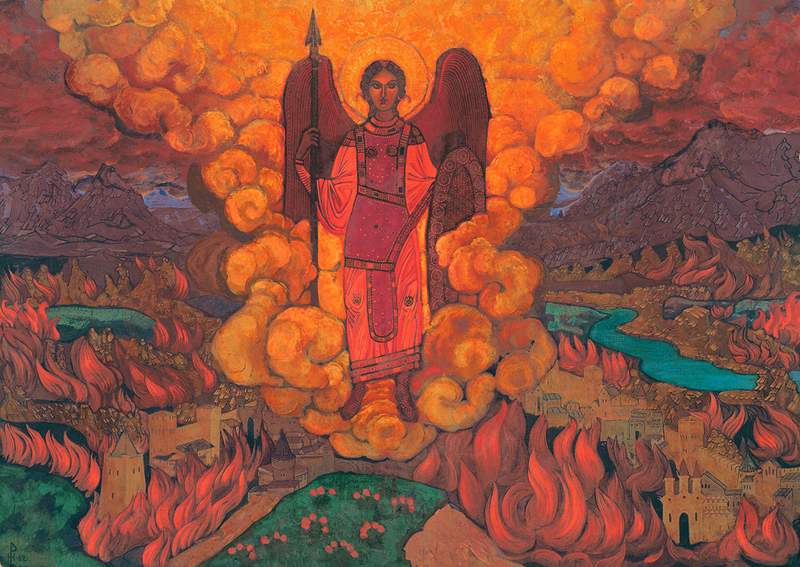 The last angel, 1912 // After finishing the Karl May Gymnasium in 1893, Nicholas Roerich matriculated simultaneously at the law faculty of St. Petersburg University (graduated 1898) and the Imperial Academy of Arts. From 1895, he worked at the studio of the renowned Arkhip Kuindzhi. At that time, he was in close contact with such eminent cultural figures of the time as Stasov, Repin, Rimsky-Korsakov, Grigorovich, and Diaghilev. The Messenger, 1897 // In 1897, Roerich graduated from the St. Petersburg Academy of Arts, and his diploma piece "The Messenger" was purchased by the famous Russian art collector Pavel Tretyakov. In Russia, the largest collections of works by Roerich Sr. are now preserved at the Tretyakov Gallery and the Museum of Oriental Art in Moscow. 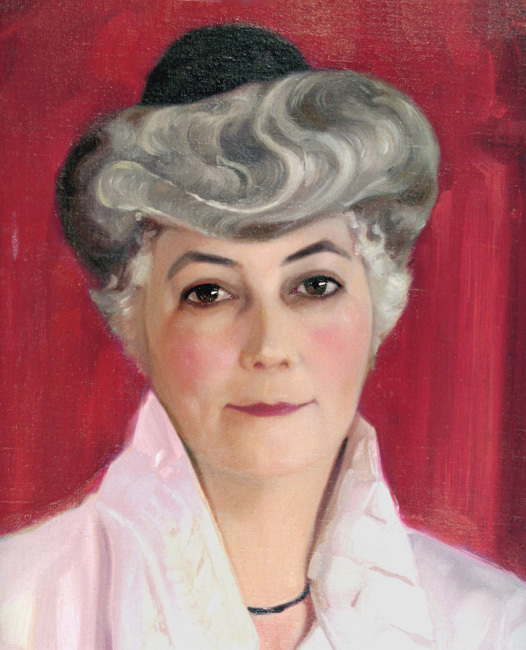 The portrait of Elena Roerich, 1931 // Many of the artist's canvases were based on the images, thoughts, and creative insights of his wife Helena. 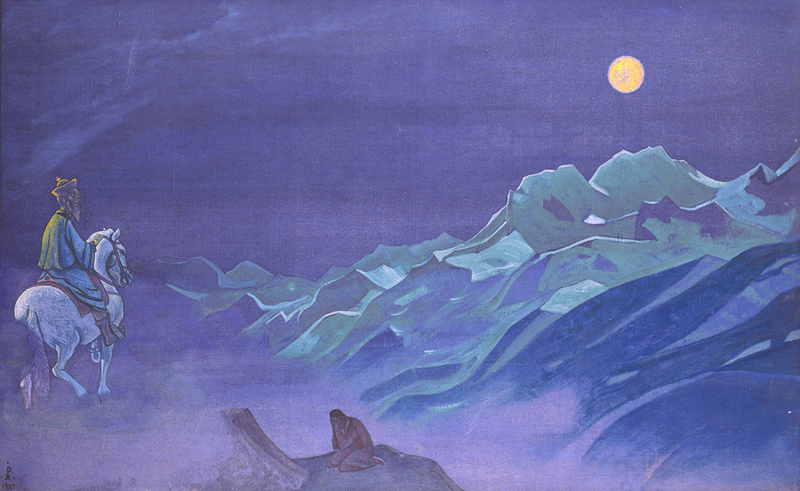 But her perceptions found expression not only in his paintings - it is difficult to name a single area of Roerich's activity in which they did not feature. 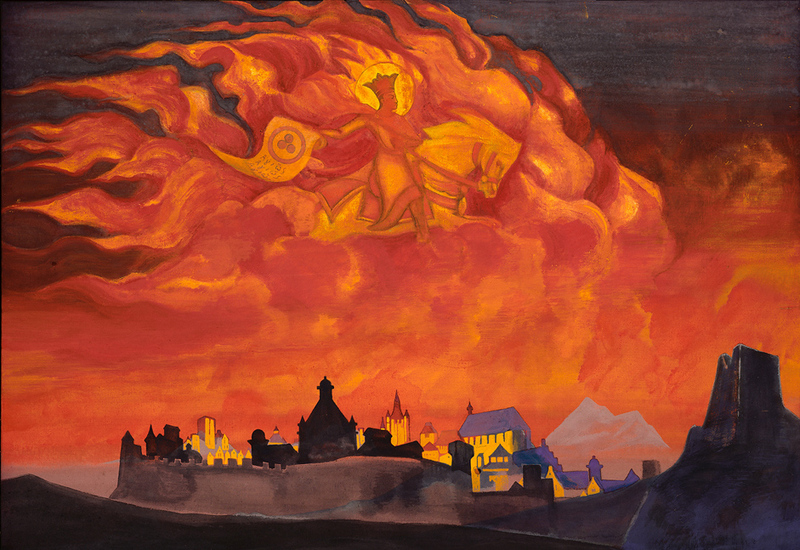 Behind every creative act of Nicholas Roerich - be it his poems, stories, paintings, or journeys - there always stood Helena. 1902 saw the birth of their son Yuri - the future Orientalist George de Roerich, and 1904 Svetoslav, who embarked on the same artistic path as his father. 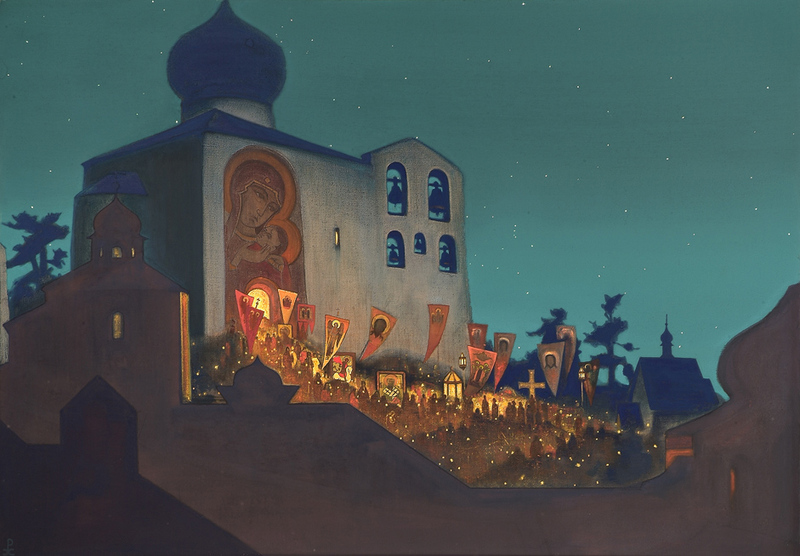 Russian Easter, 1924 // In 1903-1904, Roerich and his wife journeyed around old Russia. They visited more than 40 towns and cities, famous for their ancient monuments. The aim of this "trip to antiquity" was to study the roots of Russian culture. 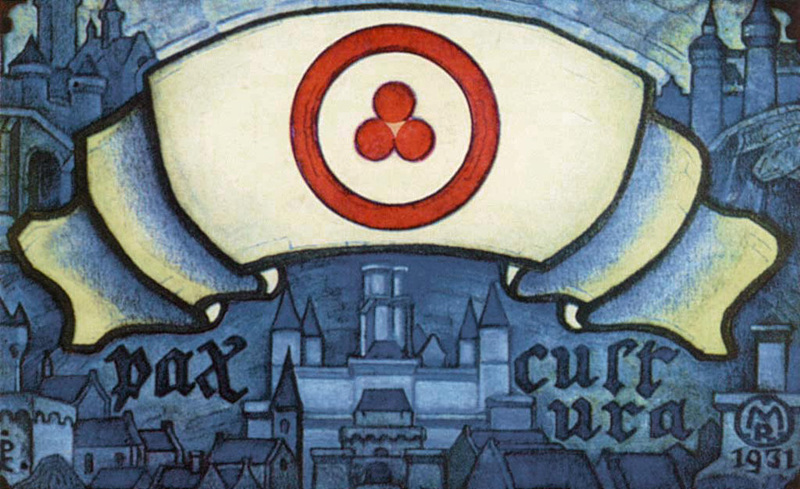 The result was not only a major series of paintings, but also Roerich's first articles, in which he was one of the first to give voice to the huge artistic value of old Russian icon painting and architecture. By this period, his paintings also touched upon religious themes, executed in the form of murals and mosaic sketches for Russian churches. 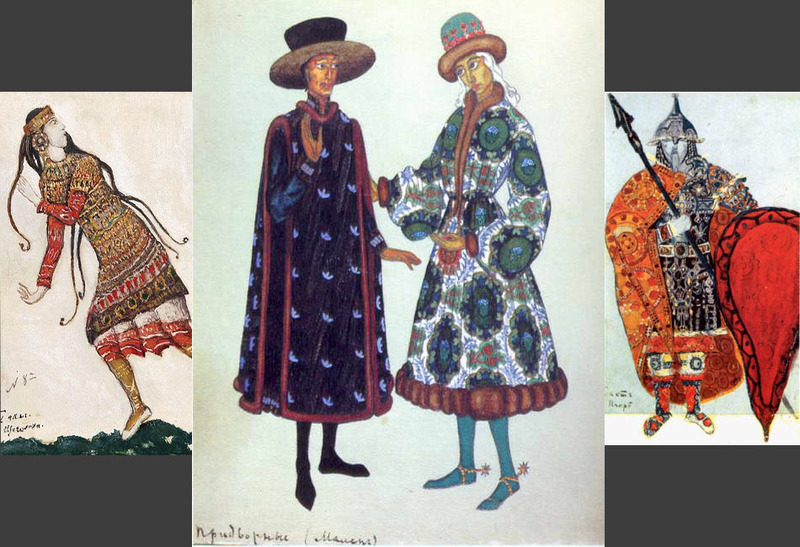 Sketches for courtiers' costumes, 1912, costumes for the Rite of Spring ballet, 1912, for Prince Igor opera, 1914 // The multifaceted talent of Nicholas Roerich clearly manifested itself in his works for theatrical productions. In Diaghilev's famous "Russian Seasons," the "Polovtsian Dances" from Borodin's "Prince Igor," Rimsky-Korsakov's "The Maid of Pskov," and Stravinsky's ballet "The Rite of Spring" all featured sets and costumes designed by Roerich. 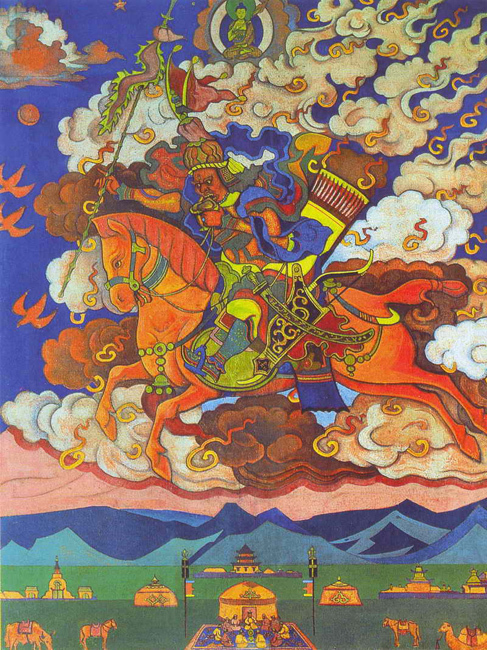 Great rider Rigden Jyepo, messenger of shambhala, 1927 // Thanks to Helena, Nicholas Roerich became acquainted with the oeuvre of the great Indian thinkers Ramakrishna and Vivekananda, and the literary canon of Rabindranath Tagore. 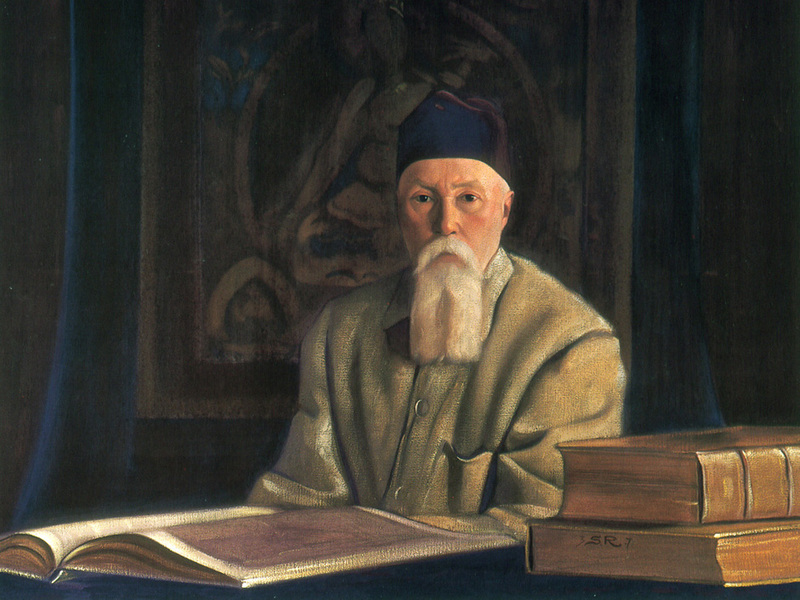 Together, he and his wife studied the Upanishads.Roerich's acquaintance with Oriental philosophy is reflected in his work. 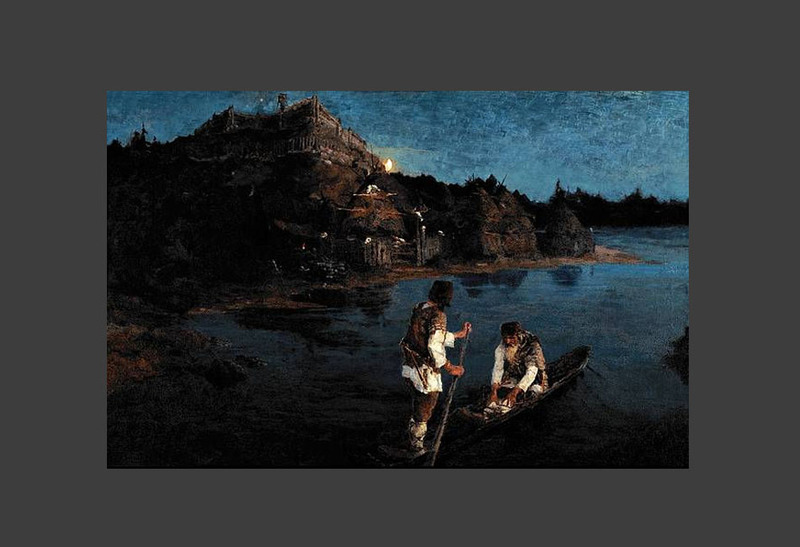 Whereas in the artist's early paintings the defining motifs were ancient pagan Russia, colorful folk epics, and images of primeval splendor as yet untouched by natural calamity ("Building a City," "Idols," "Visitors from Overseas," etc. ), by the mid-1900s Indian and the Eastern themes were appearing more frequently in his paintings and literary works. 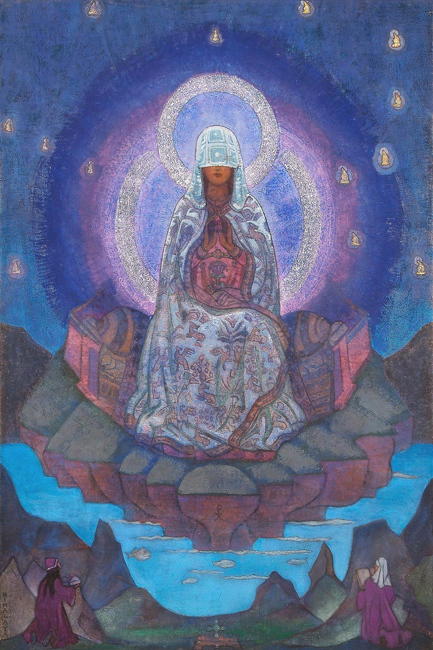 Saint Sophia, the almighty wisdom, 1932 // In May 1917, serious lung disease forced Roerich and his family, at the insistence of his doctors, to move to Sortavala, Finland, on the shores of Lake Ladoga. After the revolutionary upheaval of 1917, Finland closed its borders with Russia, cutting Roerich and his family off from their homeland. In autumn 1919, he accepted an invitation from Diaghilev to work as a set designer for the staging of operas by Mussorgsky and Borodin in London. He accepted and moved with his family to England. The mother of the world, 1924 // As Roerikh said, "A man only discovers Beauty through Culture, an inseparable part of which is Creativity." This concept was set forth in the Living Ethics books, which the Roerichs were directly involved in composing. The series was the result of their philosophical discussions, during which Helena made notes and Nicholas immortalized the cosmic ideas in fine artistic imagery. 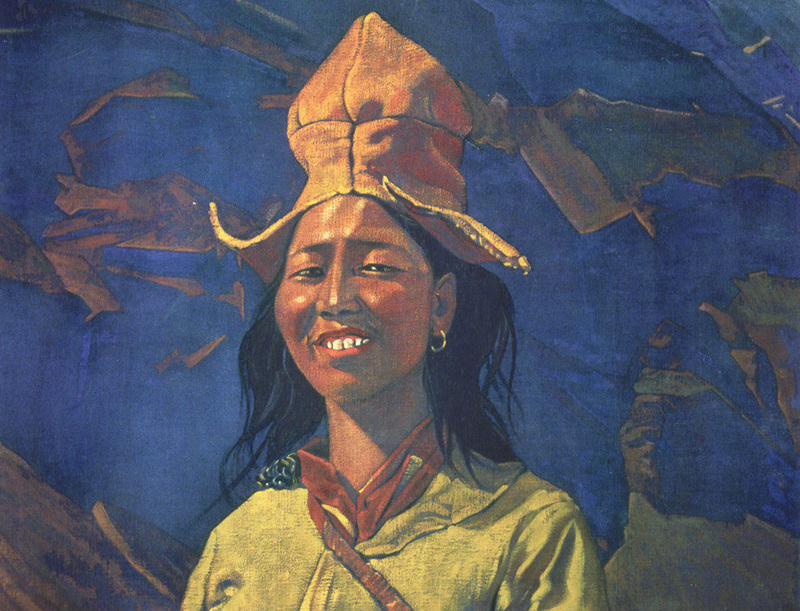 Girl in a Yellow Head-dress, 1930s // In 1923, Svetoslav Roerich visited India for the first time. He acquainted himself with the most famous architectural masterpieces of Indian culture, and the country's wealth of ancient and modern art. In India, he embarked upon his unique collection of Oriental works, which has been almost completely lost. 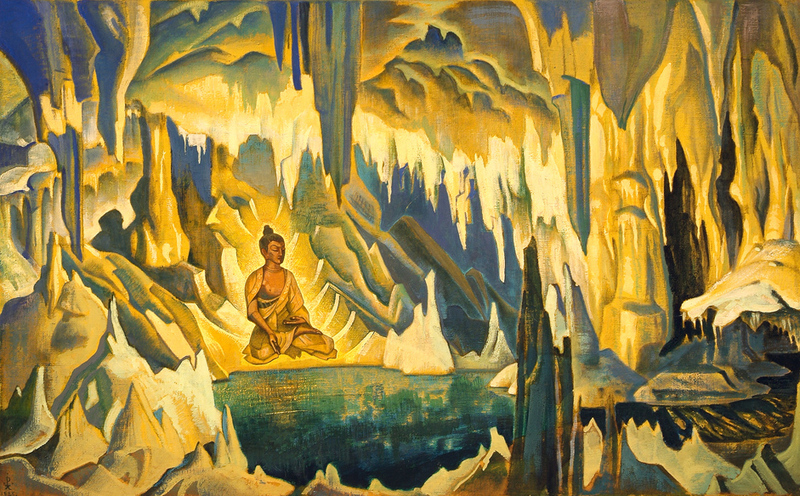 Buddha the winner, 1925 // In July 1928, Roerichs founded the Urusvati Institute of Himalayan Studies ("Urusvati" means "Light of the Morning Star" in Sanskrit). There, in the Kullu valley in the Western Himalayas, Nicholas and his family found their home. India would provide the backdrop to the last period of the artist's life. The pact of culture, 1931 // In 1930, in anticipation of war, Nicholas Roerich drafted a special pact on the preservation of cultural valuables in times of war and civil strife. The Roerich Pact is of significant educative value. "The Pact on the Protection of Cultural Treasures is required not only as an official instrument, but as an educational law with which to imbue the next generation of school children with noble ideas about preserving the true values of all humanity." This cultural initiative found widespread support throughout the global community. The idea was welcomed by Romain Rolland, Bernard Shaw, Albert Einstein, and Tagore. The signing of the Pact took place on April 15, 1935, at the White House in Washington.